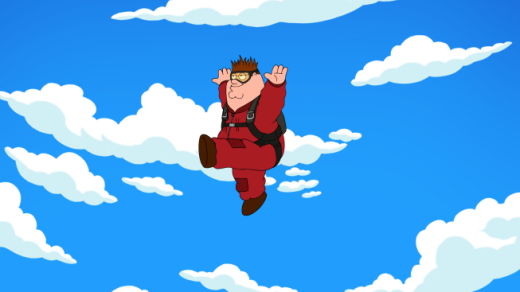 In a Family Guy tradition, the series aired an episode this week where Peter becomes a temporary member of some other culture. "Turban Cowboy" focused on Peter wading in the shallow end of the Islam pool, making rather easy jokes and exploiting lazy stereotypes about Muslims. Now, this show does not have the best track record when it comes to making fun of anything outside of white male culture, as it all just feels unnecessarily cruel. I groaned when it turned out that Peter's new friend, Mahmoud, was actually a terrorist - it came out of nowhere, especially as the suspicions of Joe and Quagmire were explained as being off-base. The show could have played the "things are not actually they seem" card or anything of substance to subvert the obvious here. Sure, when Mahmoud did turn out to be a terrorist, then there was some lip-service paid to the idea that not all Muslims fit this bill. But it felt like a half-hearted attempt to have it both ways. This was a stereotypical storyline that makes fun of a minority group for being different from traditional culture, and the half hour concluded with the status quo having been restored - and nothing have been learned. It's just a regrettable pattern of behavior for the series, which I don't think has earned the benefit of the doubt to say that it's intelligently poking fun at a group that has been marginalized and mocked consistently in pop culture and usually painted as the villain. For the show to follow that path and to barely try to subvert the story, it's just lazy and offensive without being funny. Humor that offends is one thing, and there were moments like that, such as the casual extreme violence of Peter's cell phone triggering explosions. That was probably the funniest aspect of this episode, as it served as a clever callback. But too often the jokes felt mean. This isn't just limited to this one episode, but to the later seasons of the series as a whole. When the show avoids this type broad and disposable humor, it's at its best. I don't expect Family Guy to be as revolutionary as its earlier days, when its humor went to shocking places yet still had a heart to it. Remember the outrage over the "When You Wish Upon a Weinstein" episode that was ultimately benign and surprisingly respectful to Judaism while still making joking references to the religion? It had a true sense of its perspective. Now it has little of the heart left to it, preferring to just be offensive, and the only people getting outraged by the show is the Parents Television Council. It's just a shame because I know this show can be better. Check out our Family Guy quotes for the best lines from this and other episodes. Peter: Can I listen to my iPod on the way down? Skydiving Instructor: Yeah, just as long as it's not Tom Petty's "Free Fallin'." Joe: Skydive? I'd be totally up for that! 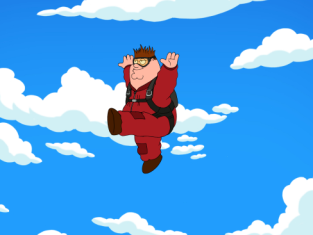 Quagmire: Yeah, I've always wanted to try skydiving! Peter: Really? Eh, could be fun I guess.